Breast cancer is the most common form of cancer among women. On Friday 30th of October 2009, a Pink Walkathon, dedicated to spreading breast cancer awareness commenced at 8am from BurJuman. It is an integral part of the mall’s Safe and Sound breast cancer awareness campaign. Now in its sixth year, this annual charitable event aims at raising both awareness and funds for breast cancer. 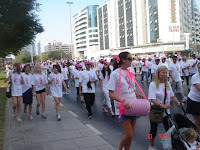 Approximately 8,000 men, women and children, and also a number of schools and corporate groups took an initiative, walking the 3.6-kilometer Pink Walkathon. 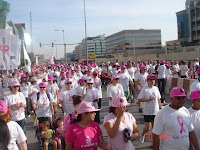 All the supporters were provided with t-shirts, caps and pink ribbons to highlight their respect and dedication. During the walk there were many attractions which caught the attention of the audience. Face painting, balloon benders, pom-pom’s, pink drums and entertainment acts was enjoyed by all. “The generous spirit of the community is alive and well judging by the overwhelming response we saw today, a testament to their inherent generosity,” said Sabina Khandwani, head of PR and marketing, BurJuman. Funds raised through the event will be monitored by Red Crescent and go towards generating greater awareness.